In the Japanese version of Fire Emblem: Radiant Dawn, the character Kyza (Kisa in the Japanese version), a member of the Laguz Beast Tribe, is gay, and openly in love with his superior officer Ranulf. He views himself as a rival with fellow warrior Lyre (a female Laguz) for Ranulf’s affections, though Ranulf would prefer to not be involved in the triangle at all. 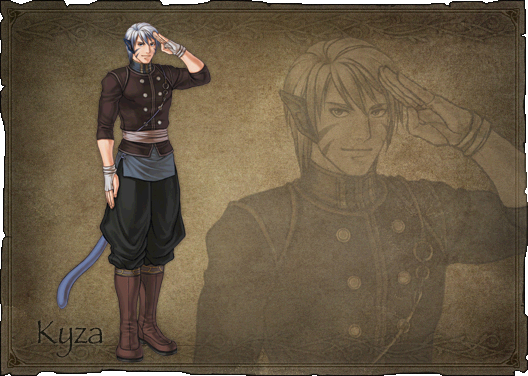 Kyza is depicted in the Japanese games as being very formal toward others, but when only in the company of Ranulf and Lyre, his speech patterns change to use very strongly feminine Japanese. The character’s depiction is generally used for comic effect, though this characterisation was entirely altered in localization to remove the feminine speech patterns and the attraction to Ranulf. This entry was posted in 2000s, Changed in localization, Characters, Games by Decade, Gay, Gay (explicit), Playable Character, Queer Men on February 10, 2017 by Adrienne Shaw.